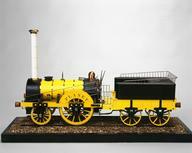 Model steam locomotive, 1/24 scale, Timothy Hackworth's 0-4-0 locomotive `Sans Pareil', 1829, model built c.1960. Painted green. Overall: 180 mm x 252 mm x 76 mm.